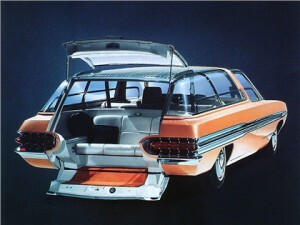 Way back in 1964 Ford debuted a concept car known as the Ford Aurora. 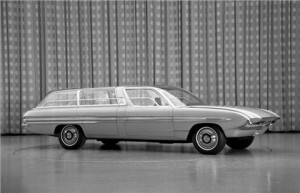 A space age looking station wagon type vehicle that bore more than a passing resemblance to something George Jetson might drive. 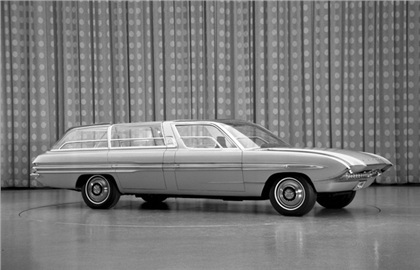 The Ford Aurora featured a a glass bubble roof with a power operated polarizing sunscreen and outrageous space rocket style exterior body styling. 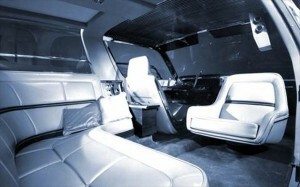 Inside the Aurora, the outrageous styling and installed gadgets goes a step further. Inside the boot, which was accessed by no less than clam-shell type cargo door arrangement was a rear facing children s seat. The second row of seats featured a wrap around sofa which could be access be a suicide door on the passenger side. The front passenger seat, which didn’t look entire dissimilar to the captains chair in Star Trek could be spun round through 360 degrees to face the wrap around sofa. Next to the wrap around sofa was a mock cocktail lounge, featuring a mini bar, refrigerator and a combination stove. The car also featured 3 sound systems and the ability to watch TV too. The drivers dash featured a very futuristic gadget, it wasn’t actually functional, but someone at Ford obviously had the good foresight to include it. A moving map system, which apparently relied on radio signals to pinpoint your position. In the 1960’s there were computer systems that could track a car to within a few miles of accuracy, but these computer systems were a long way off being able to fit into a conventional car. The fact remains that the concept designers hit the nail on the head predicting Satellite Navigation Systems even though they had absolutely no idea as to how such a system would actually function. There’s probably a very good reason that wraparound sofas, mini-bars and an in-car stove didn’t really make it to mainstream cars; this was just a concept car after-all and at the time it would probably of been easy to dismiss the in-car moving map system as absolutely ridiculous. But Ford got some of their predictions absolutely spot on; the glass panoramic roof and in car entertainment systems are now common place in many cars and Sat Nav is an absolute must have for many of today’s consumers. ← New Civic for 2017: What Auto Express think it should look like.